Crohn’s disease is a bowel disorder that is most likely to start in the 15 to 30 year age group or at the age of 60 to 80 years. It is a chronic condition which means that it lasts a lifetime. There are periods where the condition is in remission where there almost no symptoms. However, in the active stages and with flareup, the symptoms of Crohn’s disease can be severe and debilitating. Crohn’s disease is one type of inflammatory bowel disease, the other being ulcerative colitis. Inflammatory bowel diseases (IBD) are characterized by inflammation of the colon and the small intestine. However, with Crohn’s disease, this inflammation can sometimes occur as high up as the stomach and even the mouth. Crohn’s disease causes severe diarrhea, abdominal pain and malnutrition. It can cause inflammation in different sections of the digestive tract simultaneously. The colon and the last part of the small intestine (ileum) are the most commonly affected areas. 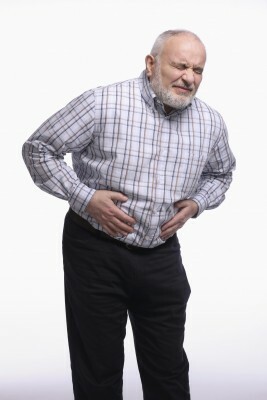 Although diarrhea is a typical symptom when the condition is in its active phase, sometimes constipation may also occur. Diarrhea. The inflammation of intestine results in secretion of large amounts of water and salt, which are not completely absorbed by the colon. This results in diarrhea. Abdominal cramps and pain. Inflammation and ulceration results in thickening of the intestinal walls. This leads to pain and cramping. In severe cases, the pain may be accompanied by nausea and vomiting. Blood in stool. The inflamed tissue may ulcerate and bleed resulting in blood coming out with the stool. Ulcers. Small sores and large ulcers may also develop on the intestinal wall. Some patients may develop eye inflammation, skin disorders, arthritis, inflammation of the bile ducts or liver, suppressed growth in children and delayed sexual development in adolescents. An abnormal immune response may result in the immune system attacking the cells of the digestive tract. A family history might increase the susceptibility to Crohn’s disease. Young age, smoking, family history, diet, and unknown environmental factors may increase the risk of developing the disease. There is no cure for Crohn’s disease, and the treatment is directed at reducing the inflammation. The treatment is often tailored to suit the individual case, to provide relief of symptoms and prevent flare ups. Anti-inflammatory drugs like sulfasalazine and mesalamine are often recommended but have side-effects like nausea, headache, and heartburn. Corticosteroids control inflammation, but have numerous side effects like swelling, facial hair growth, sweating, high blood pressure, sleeplessness, hyperactivity and an increased susceptibility to osteoporosis, fractures, infections, cataracts, and glaucoma. Immunosuppressant drugs like azathioprine, mercaptopurine, adalimumab, certolizumab, and infliximab suppress the immune response and reduce inflammation. The common side-effects are lowered immunity and increased susceptibility to infections. Other drugs like methotrexate, cyclosporine, and natalizumab are recommended to treatment-resistant patients. These drugs can have mild (nausea, diarrhea, fatigue) to severe (brain infection, liver and kidney damage) side-effects. Antibiotics like metronidazole and ciprofloxacin may help in healing the sores and the abscesses. Pain relievers like acetaminophen control mild pain. In some cases, administration of nutrients through a vein or feeding tube reduces inflammation by allowing the bowels to rest. A low residue diet reduces the number and size of stools. Patients are also given vitamin B-12 and iron supplements to prevent anemia, and calcium and vitamin D supplements to decrease the risk of osteoporosis. Surgical widening of the intestine (strictureplasty) is recommended in some patients. In severe cased, a very diseased portion of the bowel may be removed (resection). Get outside and collect some rays. Sunshine will lift your spirits by boosting your vitamin D production. Do you think obesity is considered a health threat among the senior population? Copyright © 2019 SeniorHealth365.com. All rights reserved.